Audio interfaces and mixers: What's best for your home studio? Recording music digitally at home is easier than ever, but that doesn't mean you can use just any hardware. While it's safe to say that picking the right microphone is critical, it won't do you any good in your home studio without a solid audio interface to plug it into. While using a separate input method means shelling out money for hardware, the benefits of using a dedicated audio interface far outweigh the extra cost. Simply put, an audio interface is a device that connects your computer to your microphone. Most computers have a built-in audio interface in the form of a 3.5mm microphone jack, but the audio quality you get from that generally won't cut it when it comes to recording music. Just because there is a little microphone icon next to the jack on your computer doesn't mean it's worth using for audio, and especially musical input. Think of it this way: If you're going to spend a couple hundred dollars on a microphone, why sacrifice that sound quality by connecting it to your computer with subpar hardware? Audio interfaces come in all shapes and sizes and commonly connect to your computer via USB or FireWire. They also have built-in microphone preamps, which amplify your mic's signal to line level. This is a step up in volume from what the mic can produce on its own, and can be read by a computer. Much like choosing a microphone, the best audio interface depends on the type of recording you want to do. For example, do you want to record with just one or two microphones (you on guitar and a friend on vocals)? Then all you'll need is an interface with two inputs. If you want to record a live session with your four-piece band on the other hand, you'll likely need four or more input channels. Another thing to consider: will you take advantage of equalizers, faders, and onboard effects? If so, a mixer with a built-in USB or FireWire audio interface is worth a look. However, if you've got music production software with virtual faders and effects, a bare-bones audio interface could be all you need. The Alesis iO2 Express USB audio interface costs around $90, which is about as economical as it gets for quality audio interfaces. Like other interfaces in its class, the iO2 Express has two input channels for connecting microphones via XLR or line input, phantom power for condenser mics, and gain/volume controls for each channel. Spend more cash on an audio interface and you'll get more input channels, better body construction and durability, and professional features like effects and additional ports and displays. If you're looking for more control over what gets sent to your computer, tabletop mixers often come with USB or FireWire audio interfaces built right in. So what's a mixer got that a basic audio interface doesn't? Control. Mixers have equalizers and volume faders for each individual input channel, giving you maximum control over every sound what goes into your computer. You'll also often get onboard effects such as reverb, delay, and chorus that you can apply to individual tracks. A Behringer XENYX 1204USB mixer. 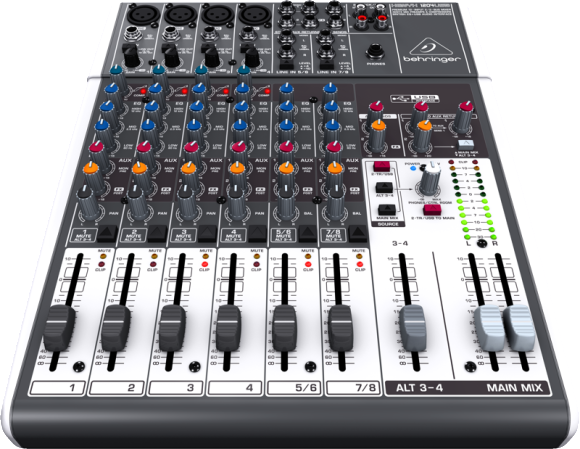 One example of a reasonably priced USB mixer is the Behringer XENYX 1204USB, which sells for around $150. This unit includes four pre-amped XLR and line-in inputs and all sorts of effects, equalizers, faders, and auxiliary (AUX) inputs and outputs for connecting to external effect pedals and boards. 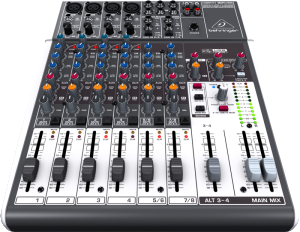 Just as with non-mixer audio interfaces, the more you pay for a mixer (such as the $400 Alesis Multimix 16 USB 2.0 FX), the more recording inputs and channels you get, as well as more effects and higher quality preamps, and filters. Another benefit of a mixer is its usefulness during live performances. Mixers are ideal for assembling multiple instruments played simultaneously into a coherent mix. For example, maybe your band's electric guitar is drowning out your vocals. Use the mixer to adjust the tracks. If you're wondering why anyone would buy anything other than a USB mixer when you can pick one up for roughly the same price as a non-mixer audio interface, space considerations and portability factor in to the decision. Mixers generally take up a considerable amount of space, whereas many basic audio interfaces are small enough to carry around. Also, you might not even need some of the features included in most mixers. Music production programs like Apple GarageBand ($15), FL Studio ($199), and Propellerhead Reason ($449) come with virtual faders, effects, and other controls for tweaking your music. One other thing: If you've already got a mixer, but it doesn't have a built-in USB or FireWire interface, there is an easy way to connect it to your computer. Some bare-bones USB audio interfaces like the Behringer U Control UCA202 ($30) lack XLR and line input for microphones, but L/R analog input and outputs let you hook up your old analog equipment to your digital home recording setup. This is the second of a three-part series on how to set up a home-based music-recording studio. Part one, which ran yesterday, talked about the right microphone to buy. Part three, which runs tomorrow, covers the software you'll need to pull together your musical production.